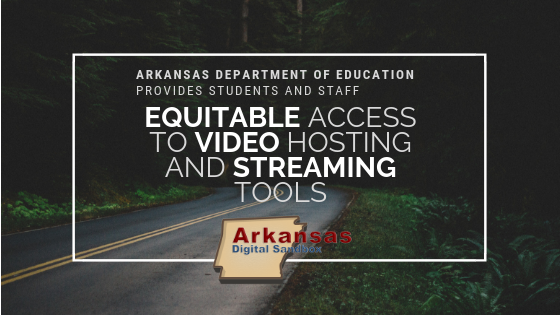 The Arkansas Department of Education (ADE) provides their staff, educators, and students free and equitable access to a complete suite of multimedia tools through the ADE Digital Sandbox. The tools and features within the Digital Sandbox include live streaming, unlimited cloud-storage, sharing of media, blended learning, digital signage, analytics, and much more. Trainings for the Digital Sandbox tools are available to all–the Education Service Cooperatives, 250 school districts, and 33,000 teachers. Sign up for the free Digital Sandbox Summit training in Little Rock, January 29th and 30th, 2019. Easily create student, teacher, or staff Sandbox account. Student accounts can be created via a district LDAP integration or by using the district-provided Google credentials. Start uploading, sharing, or creating. Explore the Help topics to get started. I interviewed Daniel Collier, Technology Projects Coordinator with ADE’s Division of Research and Technology. “The Division exposes administrators and teachers to all the different systems that are free for them to access and use,” Daniel explained. Daniel naturally became the Digital Sandbox representative. In his own role, he was creating copious levels of professional training videos and resources. “We use Sandbox to solve our own department problems and to make our jobs easier. We’re happy that it makes us more effective, but we also want to promote it to other administrators and teachers,” he concluded. “As I talk to educators and education professionals in the schools and districts, I tell them about the flexibility of the Sandbox tools,” stated Daniel. “Many administrators and teachers do not know that they have free, unlimited cloud-storage for videos, pictures, and files,” Daniel said. “Teachers and staff have been creating personal accounts to host content and videos, like another Drive account or personal YouTube channel, when in reality, the Sandbox is free and state-sanctioned,” he explained. Live streaming is Little Rock’s favorite Sandbox tool. Though they use is mostly for morning announcements, districts throughout the nation stream board meetings, special events, and are using it in other creative ways. “We’re in 2018. The TVs are gone and the SMART Boards are here. So what are we going to do with morning announcements? All you need to do is set up a live streaming channel. The link doesn’t change, so you can access the URL on the SMART Board or post it on the school page,” Daniel explained. 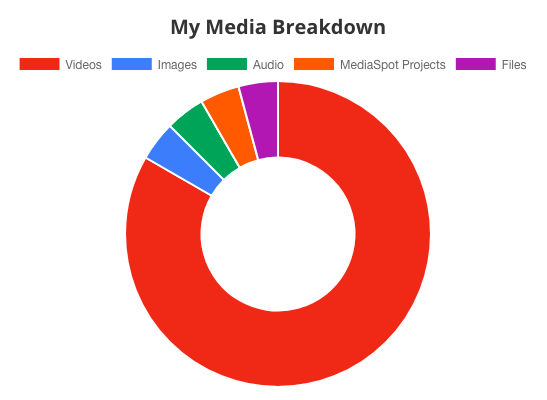 “The ability to share videos and content has proven most useful over the years,” stated Daniel, “I like that there is some flexibility and options for sharing, too.” You can also use tracking to analyze if your content is being effective. The most common methods of sharing an individual file or folder is with URL links, embed codes, or QR codes. To share an individual file or folder, click the embed icon on the media, and then select one of the three methods of sharing. Blended learning is another method of sharing content through Sandbox. With peace of mind, allow YouTube and Vimeo to accompany your lesson plans. The Vimeo and YouTube filter strips out all advertisements, pop-ups, suggested videos, and comments–leaving only the video. Now, students can watch videos without inappropriate ads or spiraling into the oblivion with endless suggested content. Next, align quiz questions throughout a video using SmartSpot and share it with your students. Not only is it engaging, it also saves teachers’ time. Students can learn at their individual pace, outside or inside the classroom, and the questions are auto-graded. Another method of sharing is by marking your files “public,” allowing all educators and students in the state access to your media. All ADE users can search within Sandbox to find others’ shared content. So, if you have remarkable content to share, mark those files at the appropriate privacy level for others to find. Video Showcase is a beautiful way to display an unlimited amount of video files on your district or school website, without the cumbersome coding process. Once setup, videos can be added and removed from your website, directly from your Sandbox account, with just a couple clicks of the mouse. To see two examples of Video Showcase, check out SAG-AFTRA Foundation, videos where actors and actresses read children’s books, and Hudson City School’s showcase of district videos. Some school administrators are testing Digital Signage, referred to as SmartSigns within the Sandbox system, to display announcements on monitors throughout a school. With SmartSigns you can easily inform students and staff of events, daily schedules–such as the lunch or bell schedule–and even link their Sandbox live streaming channel to the sign. Apply here to test out digital signage for your school. “The MediaSpot projects tool is especially helpful for administrators,” stated Daniel. He uses Sandbox’s MediaSpot feature to quickly manage the content on webpages. In his role, there are endless updates to training information, so it’s important that he can alter webpage content at a moment’s notice. “Create an HTML page and stop waiting on the webmaster.” First, drag-and-drop columns to create the bones of the webpage, add elements, such as text and video, and fill-in the elements with your content. For more advanced users, customize the page with CSS. Then, have the webmaster embed the MediaSpot project’s embed code into the website. Each account and each file has privacy permissions to keep students and content safe. Each user account has privacy settings, which are hierarchical and determined by the school district administrator. These hierarchy levels have a “view down” ability, so any higher-level account can view all content of account-levels below them. Set each file’s privacy level from the range of options including public, teachers and above, or district administrators only. Daniel’s department also provides on-site trainings, the most in-depth level being ADE Sandbox Summit. So, mark your calendars for January 29th and 30th, 2019. These are the next Summit dates to be held in Little Rock. The Summit is run as a hands-on event. Not only will you learn how several of the Sandbox tools work, but you will also have time to incorporate what you have learned. If you are looking for a general Sandbox training, you can catch a Technology Ambassador Academy or Level Up event. “Each student in Arkansas has just as much right to high quality education and technology as any other student in the state,” explained Daniel. “And that is why we’re providing Sandbox solutions and other technology at this level,” he concluded. “The benefit of Sandbox is that it’s flexible. I tell educators and education professionals that Sandbox can meet your school where they currently stand. They’re all in different places and putting out different fires, but Sandbox has solutions for them all,” stated Daniel. The Digital Sandbox Team is grateful for our partnership with the Arkansas Department of Education. It is especially heart-warming to know that every student and ADE professional has equitable access to tools that make their learning or jobs easier. We look forward to developing other advanced tools for ADE and charging through their education technology needs. Is MyVRSpot the Missing Piece in your Technology Plan? Contact us today to setup a free trial account or request more information. MyVRSpot is the leading Video Management Solution for the hosting and sharing of user-created media within the K12 education marketplace. This safe and secure system not only provides users with 24/7 access to all of their content, but allows them to search for related content uploaded and shared by other users in the district.